Precious metals futures rose slightly Wednesday. 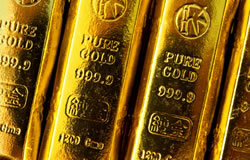 Gold was the weakest gainer overall, advancing less than 0.1% as the U.S. dollar eased. Gold for February delivery edged up 60 cents to finish at $1,284 an ounce on the Comex division of the New York Mercantile Exchange. "Technically, February gold futures bulls have the overall near-term technical advantage, but are fading. A two-month-old price uptrend is still in place on the daily bar chart, but just barely," Jim Wyckoff, a senior analyst at Kitco Metals Inc., said in a report. "Gold bulls’ next upside near-term price breakout objective is to produce a close above solid technical resistance at $1,300." Gold futures ranged from a low of $1,277.70 to a high of $1,286. They rose less than 0.1% on Tuesday. Meanwhile, silver for March delivery picked up 5.5 cents, or 0.4%, to settle at $15.38 an ounce. Silver futures traded between $15.27 and $15.45. They declined 0.5% on Tuesday. April platinum added $5.20, or 0.7%, to $796.40 an ounce, ranging from $790.80 to $798.30. Palladium for March delivery gained $1.70, or 0.1%, to $1,308.20 an ounce, trading between $1,295 and $1,319.50. On Thursday, palladium logged a record settlement at $1,348.20 an ounce. Gold fell $2.30, or 0.2%, to $1,279.80 an ounce. Silver was unchanged at $15.26 an ounce.